A truce (in Greek, ekecheiria, which literally means "holding of hands") was announced before and during each of the Olympic festivals, to allow visitors to travel safely to Olympia. An inscription describing the truce was written on a bronze discus which was displayed at Olympia. During the truce, wars were suspended, armies were prohibited from entering Elis or threatening the Games, and legal disputes and the carrying out of death penalties were forbidden. The Olympic truce was faithfully observed, for the most part, although the historian Thucydides recounts that the Lacedaemonians were banned from participating in the Games, after they attacked a fortress in Lepreum, a town in Elis, during the truce. The Lacedaemonians complained that the truce had not yet been announced at the time of their attack. But the Eleans fined them two thousand minae, two for each soldier, as the law required. 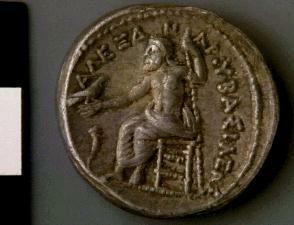 A mina was equivalent to 100 drachmas, and one drachma was an average worker's daily wage, or the price of a sheep. Thus, the fine was a heavy one, equal to 200,000 drachmas.